La Bendición means “The Blessing” in Spanish. 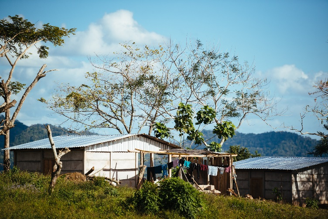 Founded in 2015 by Agros International, a longstanding partner NGO of EWB-PSP, this community is located in rural Nicaragua and is the new home for over 50 families who moved there in search of financial independence. Working alongside Agros, the residents of La Bendición have developed a self-sustaining community to call their own, complete with residential buildings and developed crop fields. As the La Bendición Community were settling into their new homes, they came against an urgent need for a sustainable and reliable source of clean drinking water. Agros worked with the community to utilize two nearby existing water distribution systems, but these were found to be decades old and in poor condition. A landslide also caused permanent damage to one of these systems rendering it unusable. The lack in supply forced the community to ration their water use as daily shortages were a common occurrence. The quality of the source water also caused health problems for the community due to its susceptibility for contamination. EWB-PSP worked with the community of La Bendición to rehabilitate the two existing water sources and develop a third, supplemental source. EWB-PSP designed a new water distribution, storage, and treatment system to provide the community with a sustainable supply of water. The community individual household spigots. The team is currently evaluating several new sources of water for feasibility and water volume and also is looking into rehabilitating existing systems. The proposed water distribution system will be designed alongside new water treatment system and storage tank. EWB established a relationship with La Bendición Community with the help of Agros International. EWB team conducted its first assessment trip to the community. They spoke with community members regarding their water needs, evaluated the existing water systems and collected hydraulic information. The EWB team worked with the community and Agros to evaluate alternatives for the water sources, distribution system, storage tank, and treatment. The selected alternative was to rehabilitate the two existing spring sources and develop a nearby third spring source with a pump. The sources are routed to a single concrete tank with chlorine treatment. The team worked with Agros to select and contract a local engineer to supervise construction during summer 2018. The EWB travel team visited La Bendición in April to meet with the contractor and kick off construction. They supervised the development of the new spring source and field-located the pumphouse and tank. The EWB team also prepared Agros staff to train the La Bendición water committee on operations and maintenance of the new system. The EWB team received weekly reports from the contractor regarding progress. The community provided unskilled labor, such as digging trenches and laying pipe, while the foreman and his team constructed the tank, spring boxes, and pumphouse. Water meters and spigots were installed at each house. The contractor experienced several delays over the summer due to a political crisis, but the project finished successfully both on budget and on schedule. By November 2019, the construction was complete and the residents were excited to have clean water. Even the mayor of the municipality came to celebrate the inauguration of the new water system! This project has now entered the monitoring and evaluation phase. 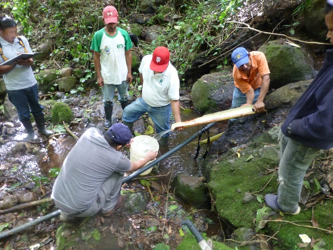 The team will continue to monitor the success of the project throughout our 5-year commitment to La Bendición to ensure the water system is sustainable. Due to the political environment, EWB-USA has suspended travel to the country, but the EWB team is planning to have the local EWB country office in Nicaragua perform the first monitoring trip to La Bendición in summer 2019.